In this discussion-based session, Lucy Atkins offers techniques, tips and tactics for aspiring authors. 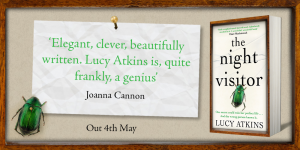 Lucy talks about how she crafts her own ‘noir’ fiction, exploring her writing process – from plotting (or not) to researching beetles for The Night Visitor, and getting up at 5am to write. She will focus specifically on techniques for creating suspense and tension – and why every author needs them. The session will include information for aspiring authors on how to find a literary agent, and how to get a book published. Blackwell’s Westgate is thrilled to host a panel of fantastic crime writers to discuss their new books on 24th July 2018. 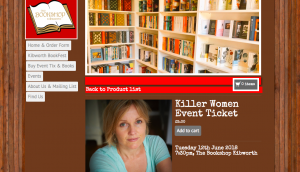 The authors will introduce their books and writing, as well as discussing crime fiction. Crime Fiction is booming in the UK and sales of crime writing and thrillers growing faster than other fiction genres. Much of this growth has been driven by psychological thrillers. We look forward to listening in on the authors’ conversations and hearing why they think British readers love crime so much! The event will be chaired by Barry Forshaw. 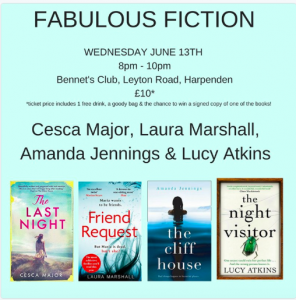 At the end of the discussion there will be an opportunity for questions from the audience and the chance to have your books signed by Lucy, JP, Cara and Olivia. A free glass wine will be served to customers in the bookshop during this event. Tickets are £5. 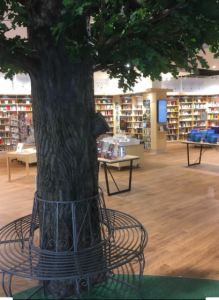 You can purchase online but if you buy your ticket at Blackwell’s Westgate or by phone 01865 980380, you can save the online fee. 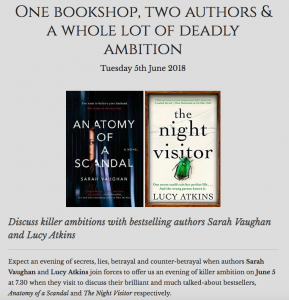 Sarah Vaughan (Anatomy of a Scandal) & Lucy Atkins talk about Deadly Ambition in their latest novels. The historian and TV presenter Kate Williams tweeted today about the contents of her mailbox at Reading University, where she is Professor of History: ‘Today’s uni pigeonhole haul: exam scripts for marking, a PhD report, a note about the photocopier & obscene & threatening letters based on my TV appearances. The joy of being a woman in the public eye…’ Mary Beard, another brilliant historian and TV presenter who certainly knows what it’s like to be trolled, immediately tweeted back advising Kate to report the letters to the police. They are, she wrote, a crime. And a crime cannot be ignored. As I watched all this unfold on Twitter I found myself wondering whether anybody is leaving poison pen letters in historian Simon Schama’s pigeon hole? Is anyone Twitter Trolling the handsome David Olusoga about his hair? Or publicly shaming Dr David Starkey for his glasses? Or telling Dan Snow that he’s fat. I doubt it. But when a female historian appears on TV she ceases to be judged on her intellect or wit or presenting skills. Instead she’s judged by the sum of her (body) parts: hair, teeth, bum, age, clothes. I cannot imagine what this must add to the pressure these women are already under. Their jobs (juggling intense work in both academia and TV) are incredibly demanding. They know they are being scrutinized. As I watched the Twitter discussion, I found myself thinking about my character, Olivia, in the Night Visitor. Olivia, like Kate Williams, or Susannah Lipscombe (who helped me with the research for the character) is a history professor who also presents TV programs. She has a brilliant career, a talented husband, three children and houses in London and Sussex. But she also has a terrible secret and if the truth is ever exposed then her career will be in tatters – she will face public ridicule and shame. When you are in the public eye, with a huge Twitter following and an awareness of how vicious people can be, then the stakes must feel very high indeed. Only one person knows Olivia’s secret and that is Vivian, the sixty-year-old housekeeper of a Sussex manor. Vivian has become Olivia’s unofficial research assistant and on the surface the two women could not have less in common. Vivian is single, unattractive and socially awkward, devoted to her rescue mutt Bertie. But as the novel unfolds it becomes clear that my characters have far more in common than they might ever believe (or admit to). They are both ambitious and very clever. And they both care, very deeply, about their careers. 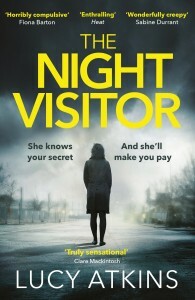 In The Night Visitor I explore how far a successful woman like Olivia might go to protect her reputation. Everything she has worked so hard to achieve – her reputation, her public image, her good name, her job, the happiness of her children – is under threat. Is it okay to lie to protect all this? Is it okay to commit a crime? I wanted to write a nail biting and entertaining book, but I also wanted to examine some moral grey areas. Successful women – particularly those in the public eye – get a bad rap, as Kate William’s matter of fact Tweet about her pigeonhole poison pen letters demonstrates so eloquently. I’ll admit that neither of my main characters is exactly ‘likeable’ (I find writing likeable characters very dull). But still, I felt a growing and powerful sympathy for both Olivia and Vivian as I wrote the book. Ultimately, all these women really want is to be taken seriously, for their minds. They just want to be allowed to do what they love, and to do it well, without being shamed or exposed or ridiculed. And really, where the crime in that? The Night Visitor with its smart new jacket heads out into the world for reviews and endorsements….just over a fortnight till publication.